The Big Chill meets The Little French Bistro in this sumptuous novel about six college friends reuniting on the coast of Brittany to celebrate one of their own’s fortieth birthday. With delicious food and plenty of wine, the table is set for tricky romantic entanglements and the spilling of longheld secrets. It’s summer on Nantucket and Alison is finally engaged to the love of her life. Things would be perfect—if only she could make peace between her daughters. Felicity, wild at heart yet a loving mother to her own children, and Jane, the extremely organized and high-earning businesswoman, arrive on the island hoping to get through these next few weeks without ruining their mother’s big day. But when Felicity’s husband reveals a long-term affair and Jane falls for her soon-to-be step-brother, everyone gets way more drama than they bargained for. 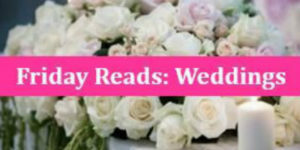 A bouquet of great wedding stories—by turns funny, passionate, bittersweet, and romantic—by famous writers from across the past two centuries. From F. Scott Fitzgerald to Lorrie Moore, and from Stephen Crane to Edwidge Danticat. EVERYMAN’S LIBRARY POCKET CLASSICS. The stories collected here—including such gems as Stephen Crane’s “The Bride Comes to Yellow Sky,” O. Henry’s “The Marry Month of May,” F. Scott Fitzgerald’s “The Bridal Party,” Joy Williams’s “The Wedding,” and Lorrie Moore’s “Thank You For Having Me”—encompass comic wedding mishaps, engagements broken and mended, honeymoon adventures, and scenes both heartwarming and heartbreaking. An “engaging and disarmingly honest” (People) examination of the search for love and the meaning of marriage in a time of anxiety, independence, and indecision. Wedding experiences come in as varied an assortment as the gowns at any bridal shop, and Doll turns a keen eye to each, delivering a heartfelt exploration of contemporary relationships. Funny, honest, and affecting, Save the Date is a fresh and spirited look at the many ways in which we connect to one another. Lottie is thirty-three and sick of long-term boyfriends who don’t want to commit to marriage. When her old boyfriend Ben reappears after fifteen years and reminds her of their pact to get married if they were both still single at thirty, she jumps at the chance. There will be no dates and no engagement—just a straight wedding march to the altar! Next comes the honeymoon on the Greek island where they first met. But not everyone is thrilled with Lottie and Ben’s rushed marriage, and family and friends are determined to intervene. Will Lottie and Ben have a wedding night to remember or one to forget? In her final novel, Dorothy West offers an intimate glimpse into African American middle class. Set on bucolic Martha’s Vineyard in the 1950s, The Wedding tells the story of life in the Oval, a proud, insular community made up of the best and brightest of the East Coast’s black bourgeoisie. With elegant, luminous prose, Dorothy West crowns her literary career by illustrating one family’s struggle to break the shackles of race and class.